This is a switchplate the goes into your center console of your 2016 Camaro. It has the ability to fit up to 9 switches that can be custom-labeled to suit your needs. The plate comes with 4 switches included in the base price, and each additional switch adds some cost. Whether you have custom lighting or nitrous oxide setups, this is what you'll need to have a central control center that is clean, and concealed. All you'll need to do is run some wire through the bottom of the console by cutting a hole to accomodate your wiring. You can do this yourself, or have a reputable shop perform the work. We also offer custom coloring on the labels. Along the top section, we can engrave and color a 6th gen Camaro silhouette (as shown) if you'd like, and we can custom color that as well. Our "emblempros.com" engraving will be colored in the color of the labeling you choose. The switchplate is made from 1/8" acrylic with another 1/8" backing plate for reinforcement. It rests in your console on 1/4" thick rails and padding to deaden sound/vibration. The switch order will be left to right, top to bottom. Just like a book. We will only use the 3 types of switches seen in the photos. If you want a modification of this design, email us. We will not provide any wiring or instructions other than what is on this page - just the switches. 4 switches are included in the base price (Except blue. Blue will add a small amount). Every switch afterward will add to the cost of the part. On / Off switches are for things like cooling fans, nitrous arming, line locks, bottle warmers. Wiring instructions here. Momentary switches are used for things you only want to happen for an instant, such as nitrous purging. 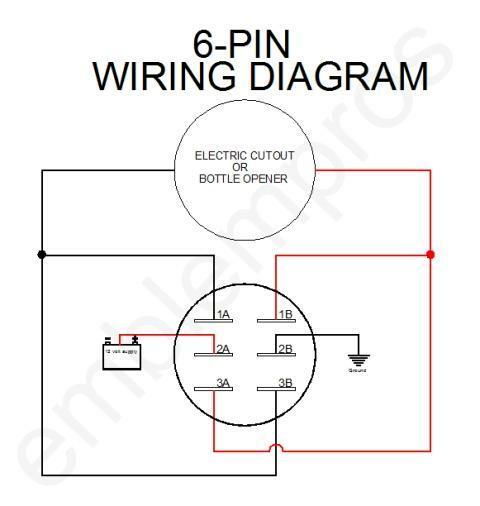 Cutout Switches / Bottle Opener Switches are used for operating cutouts and nitrous bottle openers, or anyting else that has a 2-way motor. These are 6-pin switches that are momentary in both up and down positions, meaning the moment you let go of up or down, they snap back into the off position. NOTE: Please allow up to two weeks for this product to ship. It is completely custom made to your specs, and due to the amount of parts involved, some switches/materials may need to be ordered to manufacture the switchplate to your specs. This will not always be the case, but stock needs to be replenished from time to time, and this particular piece takes a lot of different materials. We normally have all necessary parts in stock.